Hello Beauties, I hope you're all well and had a lovely weekend! I spent all day yesterday at Olympia Beauty in Kensington browsing all of the various stalls and grabbing a bargain or two (haul to come later), so it's fair to say I'm a little bit knackered...but it's nothing a good Vampire Diaries binge in bed can't sort out. Anyway, today I wanted to introduce you all to the latest collection from tarte cosmetics to hit UK soil, Discover Tarte. 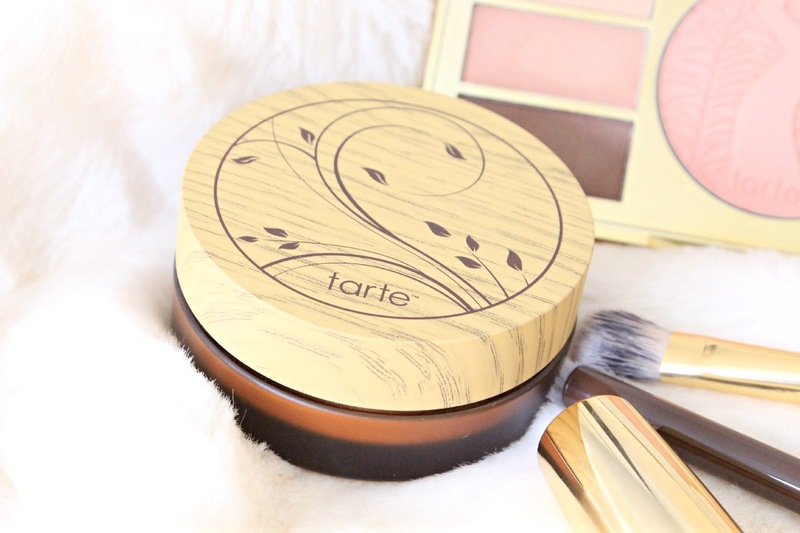 The Discover Tarte set contains seven full size items designed to help you achieve a full face of flawless makeup, and discover the beauty benefits of tart's signature amazonian clay. Not only does the kit contain everything you need to create a full face of makeup, but it also contains all of your application tools, so you really could just grab this kit and go if you found yourself in a 'makeup on the go' situation...i.e every morning on the train to work! I'm not normally one for mineral powder foundations or powder foundations in general, so when I saw this product inside the kit, I assumed that I would be disappointed. However, as I normally am with these things, I was wrong - I adore this foundation. The formula really does give you that smooth airbrushed effect, as it fills in my pores and blurs most of my imperfections, although I'd say it was more of a medium coverage instead of a full cover foundation. The formula also managed to keep my skin matte without making it look flat or cakey, which isn't the easiest of tasks. The amazonian clay formulation, infused with natural light-reflecting gemstones, really helped to give me a bit of a radiance boost without making me look too shiny either - in fact, this foundation strikes the perfect balance. The colour (light beige) does run a little dark on me but it's perfect for when I've fake tanned so not all is lost with the colour match. 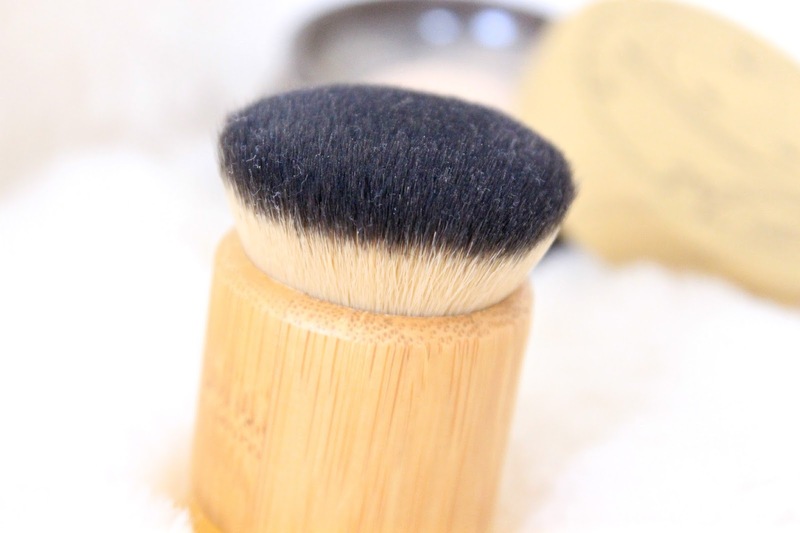 The travel size kabuki brush included is not only adorable, but it also makes buffing in the foundation extremely hassle-free and really helps to achieve that flawless look. Although I love this foundation, I do think I'd love the liquid formula more, so next time I'm in the states, I'll have to pick it up. By far my favourite product in the set has to be the limited edition eye and cheek palette. I'm sure you're all well aware of my weakness for palettes by now, so it really should come as no shock to you that I love this one, the colours are just beautiful and the formulas are to die for. I've been a big fan of the tarte amazonian clay blushers for a while now, and this one has only confirmed my love for the product. I think the shade is stunning, as it's natural enough to be worn as an everyday blush, or to pair with an intense eye look, but it has something about it which makes it unique. The eyeshadows are also seriously pretty. I love how they're neutral enough to be worn everyday, but they're a little different from your standard browns and golds. With shimmery and matte finishes too, this palette allows you to create a plethora of makeup looks, making it perfect for travel and as an everyday essential. The eyeshadow palette also comes with one of tarte's double ended eyeshadow brushes, so you have everything you need application-wise. 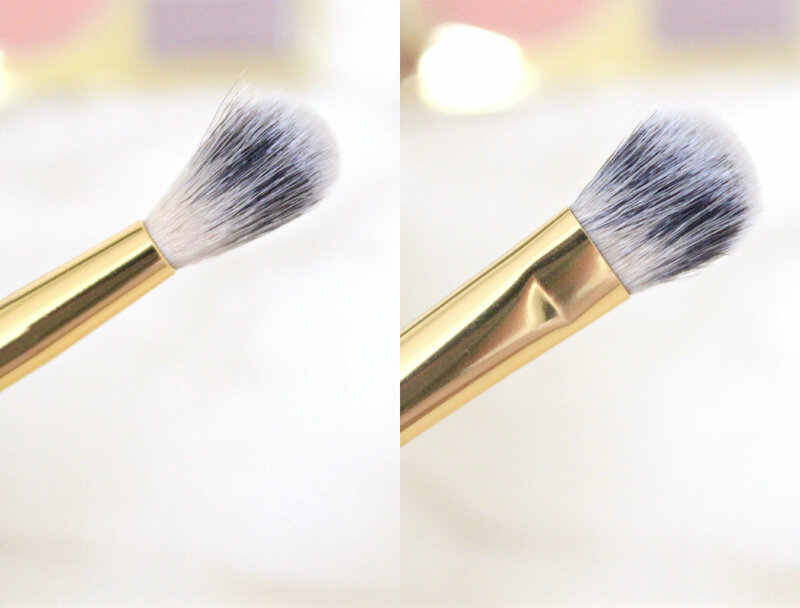 I'm not normally a fan of double ended brushes as it means I can't stack them up in my storage, however these are so seriously soft that I may have to make an exception. This is one of the few products which I've actually tried from tarte before, but nevertheless, I was still excited to see it included in the kit as it's a brilliant mascara. My lashes are naturally quite long, which is actually a nightmare when looking for mascara. Don't get me wrong, I'm not complaining, but most mascaras tend to either make them look spidery or clumpy - not a good look. However, this mascara manages to lengthen my lashes and give them more of a feathery false lash effect look, which is exactly what I look for in a mascara. You couldn't really have a makeup kit without a lipstick now, could you? Having never tried any lip products from tarte, I was excited to give this one a go and it didn't disappoint. I honestly don't think I've ever tried a lipstick that is so creamy and pigmented, one swipe and it's completely opaque and the hydration levels are out of this world. Unfortunately the colour isn't really something I would go for, I mean it's beautiful, but perhaps a little too bold for me. 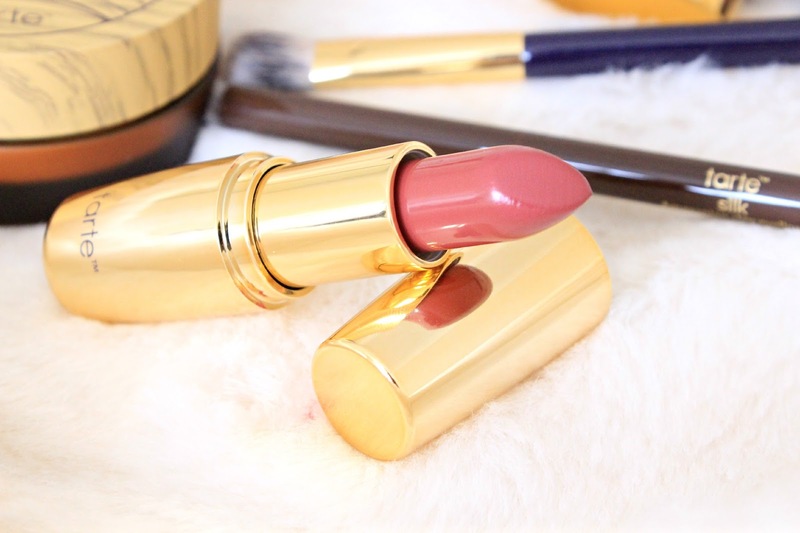 However, if you're a fan of brighter lipsticks then this one would be perfect for you. I'll definitely be picking this up in another colour though when I can! I'm sure most of you will be aware that I don't really wear eyeliner (I don't half bang on about it) so I didn't think I'd really get much use from this, however since receiving the kit I've been using it non stop. I much prefer brown eyeliner to black as it suits me better and generally looks a bit more natural, so I think the dark brown colour of this liner is brilliant, and the built in sharpener is so handy. The formula however, was what really got me with this product. I've always stayed away from pencil liners as I thought that they would pull on my eyelids and generally be a bit of a nuisance, however this one glides on like a dream and smokes out brilliantly. Overall, I adore this kit and all of the products inside, which is pretty bad news for my bank balance as I now want to buy all of the makeup. The beautiful Discover Tarte kit is now available (in the UK!) on QVC for a bargain price of £39.72 on air or £51 online, so I'd grab it at it's introductory price while you can! All of these products looks amazing - I'm yet to try anything from Tarte but it all looks insane! 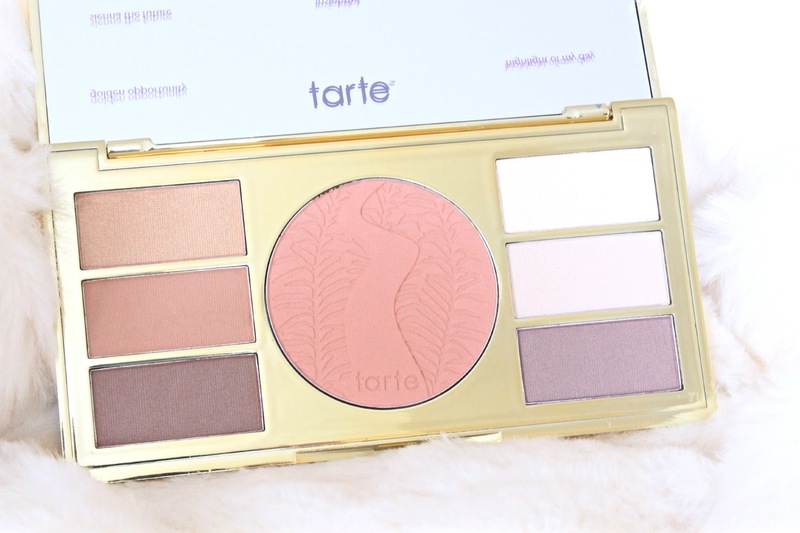 I am desperate to try Tarte, so this would be the perfect set to get going with! This looks like an amazing kit and what a lovely sounding foundation and really love the color of that lipstick. The eye and cheek palette is so pretty! 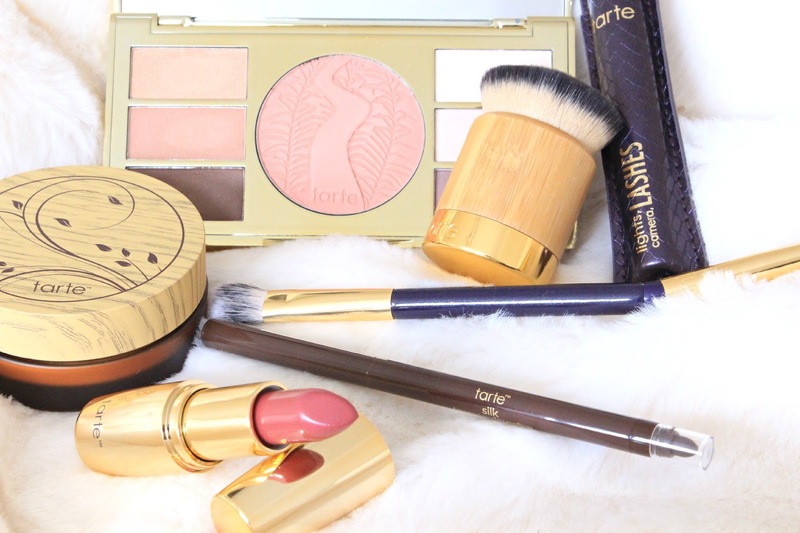 All of these products look so pretty, I'm desperate to try some things from Tarte! I've never tried anything from Tarte and I've been wanting to for a while so I definitely need to get my hands on this! This kit sounds like a winner, there's not even a single thing which you haven't praised. The lipstick and that palette looks so gorgeous. I would have loved to see some swatches. I really want to try their foundation, Tarte sounds like such a lovely brand! nice price for so much stuff! I usually prefer liquid foundations better too, and whilst I have never heard of the brand, products do look amazing! The lipstick looks such a gorgeous shade! Tarte seems like such a lovely brand! I love Tarte! The powder foundation and brush are amazing! Birchbox October 2015 - Your box, your choice.